So, New Zealand missed out on equalling the world record of 17 consecutive international victories last weekend as they were held by Australia to a draw in Brisbane. It turns out that, even had the All Blacks won, they would still have fallen 1 win short of the current record of 18 victories held by...wait for it...LITHUANIA. Yes, little old Lithuania hold the record of 18 consecutive international victories, a run which began in May 2006 with a 23-17 away win over Hungary and ended with a 27–16 home defeat to Ukraine in May 2010. The 77–5 away win over Serbia on 24th April 2010 was Lithuania's 18th straight victory, overtaking the previous record set by New Zealand (1965–69) and South Africa (1997–98). As Michael Caine may or may not have once said...not a lot of people know that. I might add that - yes - I did know that. 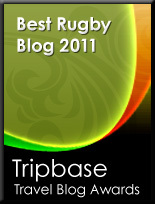 Its come up before and is really, I think, a sign that rugby on REALLY takes seriously the usual eight suspects. And men, obviosuly.